Fargo ribbons can be located in our web-store. Robust, high-volume card printing allowing basic ID card printing to highly sophisticated access cards that have embedded electronics. Using both the dye-sublimation and resin thermal-transfer printing methods, cards will have vivid colors and sharp text and bar codes for scanners. High capacity print ribbons and dual input card hoppers allow for maximum card printing and management of different card types. 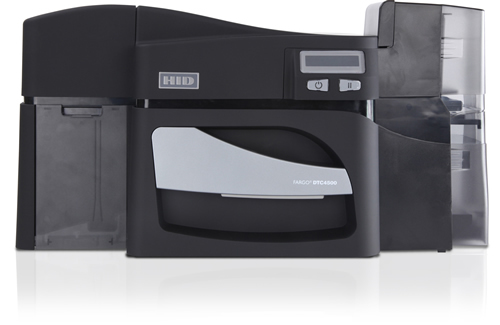 Designed to provide an easy way to increase security levels, the Fargo DTC4500e printer provides printer password protection, fluorescent panel printing, optional single or dual sided lamination and additional security options. Optional single or dual sided simultaneous lamination for highly secure cards and increased durability. A dual-side card printing module is available as an option for additional card personalization and security features. Standard dual card input hopper for increased capacity and managing more than one card type at a time. Optional encoders available for magstripe, prox cards, contact and contactless smart cards. Ethernet upgrade is available to network your printer. Need Fargo card printer help? Our blog provides step by step instructions for common Fargo printer questions.